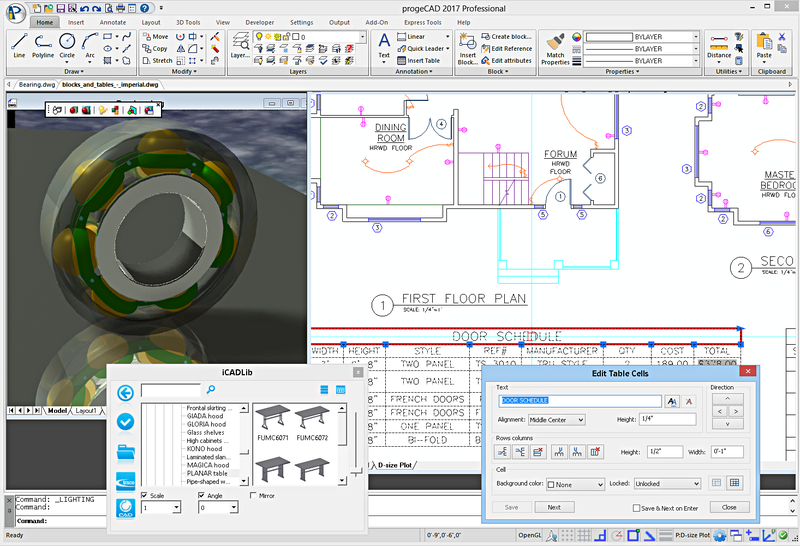 progeCAD perpetual license offers an affordable way to read and write AutoCAD files, using similar commands and toolbars as used in previous releases of AutoCAD itself. Many choose progeCAD over AutoCAD LT because of it's low cost (currently a little over AUD $500) and features like 3D modelling and AutoLISP which are blocked in AutoCAD LT. progeCAD is commonly used in a wide variety of industry domains, including building design, electrical and plumbing, telecommunications and fibre-optic diagrams, civil land survey, engineering, fabrication, joinery and much more. With progeCAD Professional 2016, a CAD drafter can create very large complex drawings and save directly to AutoCAD or AutoCAD LT without data loss or conversion. Free raster image conversion, advanced 3D shading and rendering, quick dimension tool, raster-image-to-vector converter and more. PDF & 3D PDF, SVG, STL 3D printing and Google Earth KML export, ACIS 3D Solids modelling, temporary point snap (oSnap), layers, blocks, IntelliCAD AutoLISP, VBA-VSTA, True DRX C++ API. Enhanced block data extraction, gradient boundary hatch and xref editing. progeCAD Professional includes the best IntelliCAD CAD symbols library manager free. Includes free EasyArch for architectural drawing of walls, doors, windows, stairs etc. Special upgrade promotion from IntelliCAD, AutoCAD LT, MicroStation, VectorWorks, ArchiCAD, TurboCAD Pro, Chief Architect, ZwCAD, BricsCAD Vectorworks and other CAD versions. Easy to learn. International commercial license are available in stand-alone, USB and Network versions, and well suited for business use. Free support for progeCAD is offered on caddit.net/forum. CADDIT offers a variety of license options including single stand-alone Professional, USB, Network and corporate license solutions for all size companies. Extended tech support and training options are available, although AutoCAD drawing experience is usually enough to use progeCAD CAD software quite fluently. AutoCAD 2017 DWG and Windows 10 Support, IntelliCAD 8.x with true DRX. PDF, STL 3D printer support. TCAD is a 2D CAD component.